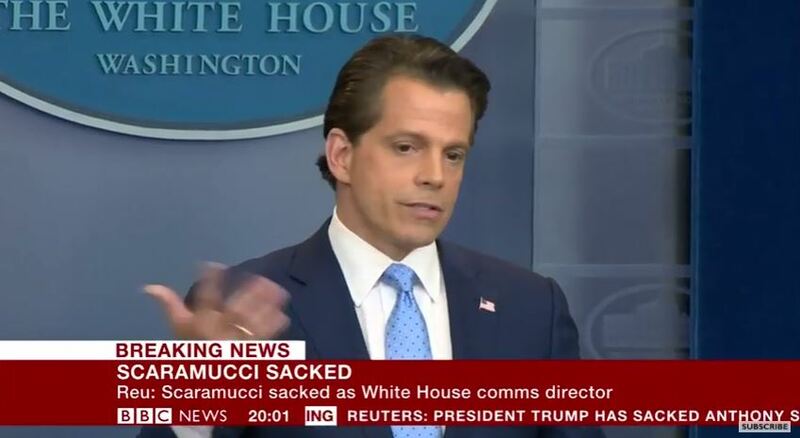 Anthony Scaramucci may go down in history as the shortest-lived White House Communications Director in history, removed Monday after only ten days on the job following a tumultuous week during which he reportedly unleashed a tirade against other members of President Donald Trump’s staff, and reports surfaced that his wife had filed for divorce. Scaramucci came into the White House – and thus the public eye and media target range – in a whirling news cycle that saw the abrupt resignation of former press secretary Sean Spicer. The past 72 hours have seen the departure of Reince Priebus as White House chief of staff, replaced by retired Gen. John Kelly. The events have reinforced the narrative that the Trump administration is in chaos. The news came only hours after Kelly was sworn in as chief of staff. He reportedly called the staff together “to impose a new sense of order and operational discipline that had been absent under his predecessor,” the newspaper reported. The Times also said “the decision to remove him came at Mr. Kelly’s request,” according to unidentified sources.